Cage those animals! EXTRA-large 38" bean bag storage holds a huge number (over 90!) of stuffed animals, extra blankets, towels, bedding, anything that you just don't have the closet space for. Made of highly durable cotton canvas with a zinc alloy zipper. A handle is sewn into the bag, making it easier to transport around the room. Makes for a quick, easy cleanup and storage for those much-loved animals that you just can't throw out without a tantrum ensuing. 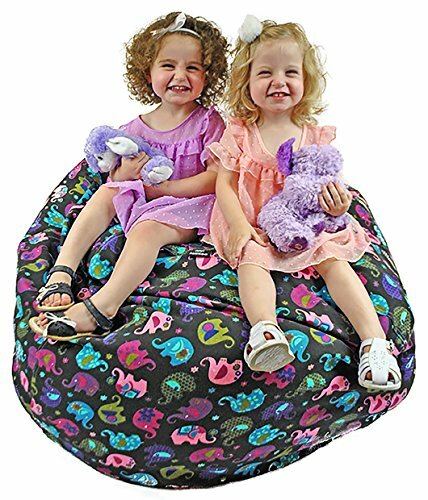 Comfortable bean bag chair for your child to plop into for movie night. He/She might even have to fight the dog for it. If you have any questions about this product by Jazzoo, contact us by completing and submitting the form below. If you are looking for a specif part number, please include it with your message. Emoji Pals Sealed with a Kids Bean Bag with Handle, Yellow, 55"